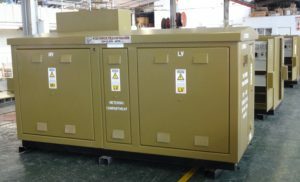 PCB Power Transformers is one of four successful bidders to be awarded as City Power’s (Johannesburg) supplier of mini substations built to their new specification. The company prides itself in the fact that it was the first supplier to have manufactured the new specification mini substation and have it approved by City Power. The mini substation is built to be vandal-proof and offers remote access from the utility’s control room. On-site access is controlled by means of a contactless smartcard. The access control system has a back-up battery which ensures a fail-safe entry system. All access doors are fully recessed to minimise vandalism, there are no external handles and the entire unit can be lifted without removing the roof. All of the company’s transformers are built in-house and carry the SANS 780 mark. The company supplies distribution transformers and mini substations which include air and oil cooled transformers from 1 VA to 2 MVA. The company is 100% black female owned with a level 1 BBBEE status. The post Local company supplies vandal-proof mini substations appeared first on EE Publishers.